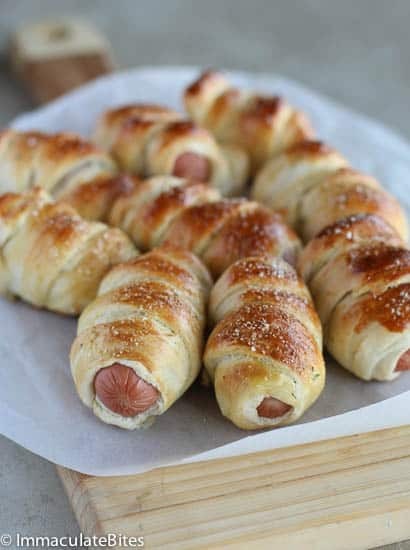 Pretzel Dog (Mini) – an American classic snack made with hot dogs that are wrapped around a soft pretzel. Great on-the-go snacks or party food! If you have kids (little boys to be specific) then you know they are relentless when it comes to their wants, not needs – everything is a need to them. My almost 5 year old (that’s how he wants to be referred to these days) wants me to make pretzel dog- granted I have never made pretzel dogs before. There is no escape from this one, he knows where I can get the recipe-in one of my cooking books, or the computer. Needless to say, there are some foods that are better left not knowing how to make. So during the Christmas break, I made these about 5 times . When it comes to these pretzel dogs his appetite is insatiable…I firmly believe there is a pretzel dog beast that has taken up residence inside of this belly- Please help! To be honest, I don’t even like hot dogs. On the flip side, I love soft pretzels. At one point in my life , a trip to the mall would not feel like one, if I did not eat it. 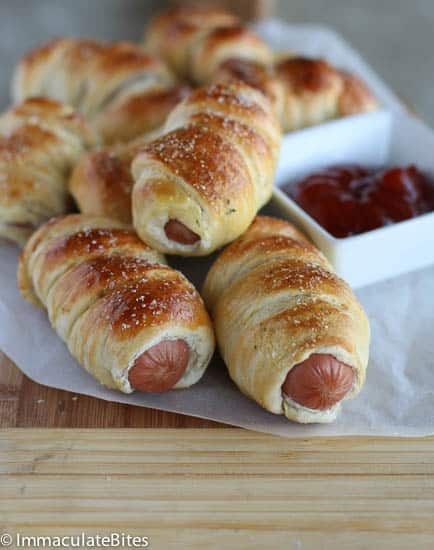 Pretzel dogs are basically hot dogs that are wrapped around a soft pretzel – it is an American Classic. This recipe is adapted from Alton Brown’s soft pretzel, I added more butter and upped the sugar to 2 tablespoons, replaced ½ cup water with milk and cut back on the salt. You can bake the pretzel without dipping it in baking soda solution. Trust me, the world would not come to an end. However, dipping the pretzels in baking soda solution helps to caramelize the pretzel dog giving it a rich and dark brown color and lends itself to the unique taste of a pretzel, the ones you would find at the mall. 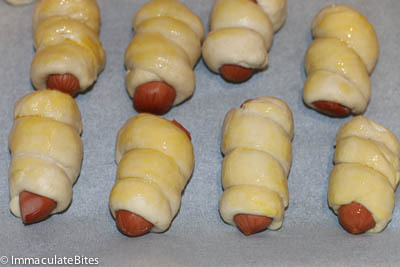 Pretzel Dog (Mini) - an American classic snack made with hot dogs that are wrapped around a soft pretzel. Great on-the-go snacks or party food! In a standing mixer combine warm water and yeast. Let it sit until dissolve for about 5 minutes. Meanwhile in a microwave safe medium bowl, combine, milk , butter , sugar, salt and microwave for about a minute. Stir until everything is melted. Dump everything into the yeast mixture. Mix for 2 minutes at medium speed. 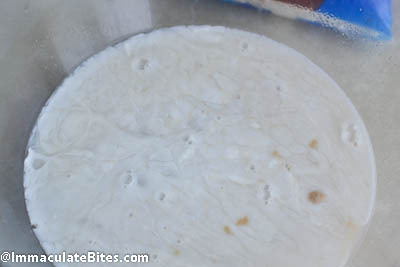 Add about 4 ½ cups of flour and continue mixing dough. 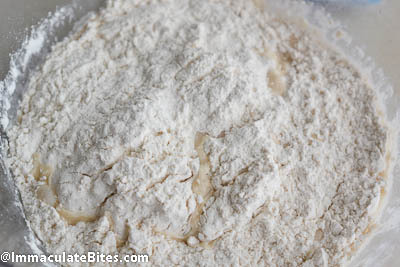 Add in enough additional flour (if needed) to make soft dough. 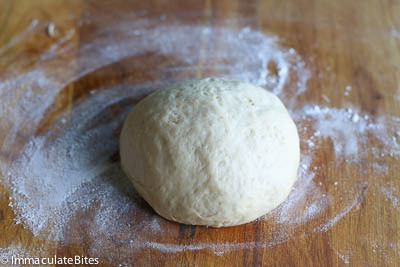 Turn dough on lightly floured surface and knead for 5 to 6 minutes or more. You may continue kneading the dough in the mixer for the remainder of the time. Place dough in a greased bowl, cover loosely with a clean cloth and let rise in a warm, draft-free place for 1 to 2 hours or until doubled. Punch the dough down and place on a lightly floured work surface. 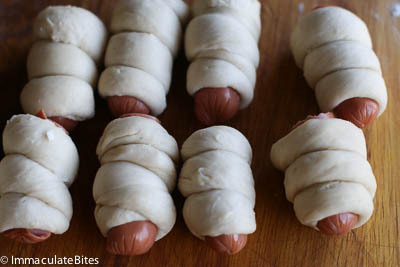 At this point the dough maybe divided and shaped into long ropes to wrap around the hot dog or sausage. You may divide the dough into 18 -20 pieces. 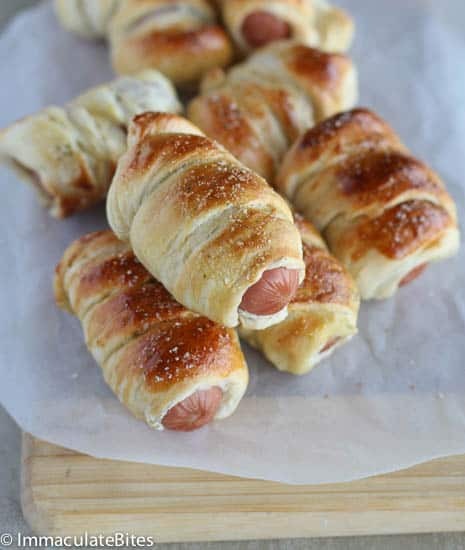 If making mini pretzel dogs, divide the hot dog or sausage in half before wrapping around the dough- about an inch of the hot dough should peak out. 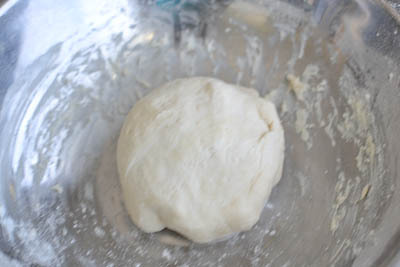 Then tightly pinch the dough at the seam to secure the dough from falling apart. Bring water to a boil , then add baking soda. 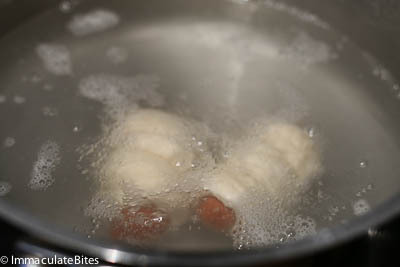 Quickly placed the wrapped pretzel dogs in the boiling water for about 30 seconds – remove with a slotted spoon and place on a paper to soak up any excess water from the dogs. 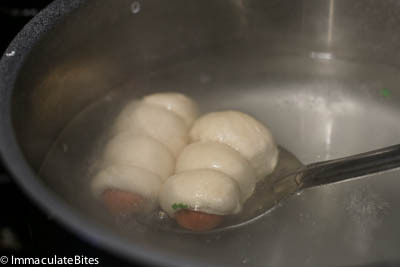 An easier way is to place about 2-3 pretzels on a slotted spoon and quickly deep in water. 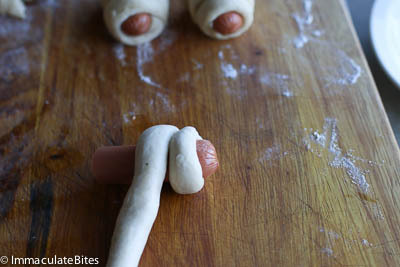 Repeat process with the rest of the pretzel dog. 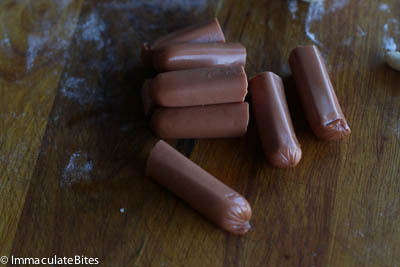 Transfer to prepared baking pan, position the boiled pretzel hot dogs so they are not to close. Bake for about 15-17 minutes until golden brown, let it cool for a couple of minutes and serve with ketchup, mustard or dipping sauce of choice. Hello! At what points do u use the butter and baking soda. Mine are in the oven right now. Thanks always! You use melt the butter with the other ingredients in the microwave. Add the baking soda to the boiling water. Kelsey, did you let it rise? It should be pliable and easy to work with after the dough has risen.Give it one more try- maybe it is the yeast. If it is too soft add a little bit more flour. 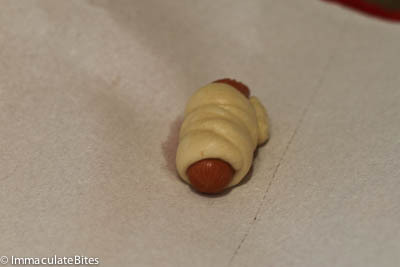 I was about to make the pretzel Dog today but the dough was kind of hard and falling apart, was very difficult to form a smooth rope. The dough is just sitting there now because I don’t know what to do with it. What might be the problem? I did half of what the recipe calls for. Thanks. I am keeping my fingers crossed. You can do it. The things we will do for out children! 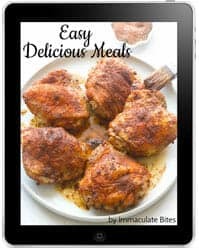 I’m loving your blog and planning to try some of your recipes soon. 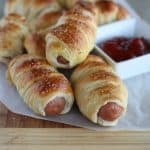 My son is too young to be all about hot dogs yet (thank goodness) but I have a feeling his daddy would not object to having some of these pretzel dogs in the meantime. Count your days Alliey and be glad for them….when he starts there no stopping. Thanks for stopping by! I love getting pretzel bites when I’m at the mall. Thank you for sharing this homemade recipe. Looks delicious! Looks like my dog! Hee Hee!